I was drawn to “How to Negotiate Like a Pro” by Mary Greenwood right away, as I have always thought negotiating as a given talent that I totally lack. The book establishes from the beginning the author’s experience in professional negotiations as an attorney, human resources director, mediator, etc., but I found it interesting that she actually included in her repertoire her experience in negotiation as a Mother. When I read that I realized, this was a book I definitely want to read to truly understand the skill of negotiating. Overall, I found the author did an awesome job presenting the reader the ballpark information needed to prepare, conduct and close a negotiation, regardless of whether at a professional or personal level. My favorite part of this book was the scripts, as it actually provided me with words as instruments to apply a negotiation strategy. In this sense I found this book very helpful because I could actually put the information into action right away on the less formal types of negotiations we all have with our family members, friends, and even co-workers. By doing, so I was surprised on how confident I felt going into a more formal level when negotiating with a customer. I definitely will keep this book as a great guide for myself! 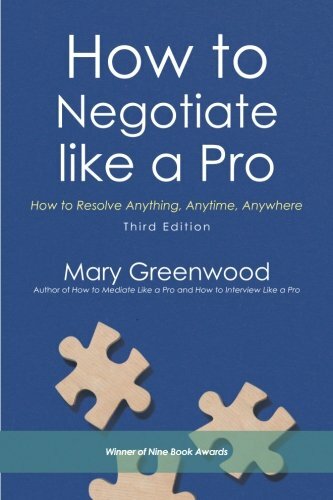 “How to Negotiate Like a Pro” by Mary Greenwood is an awesome, short, to-the-point guide which provides basic and useful information for the negotiator in all of us! I recommend it to everyone who thinks they lack the skill like I did!